Why are you making fun of my legs? I'm a good boy. 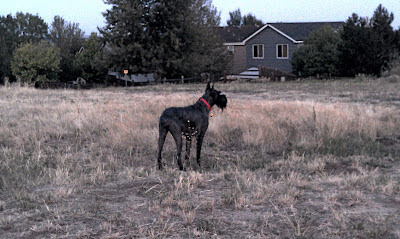 As much as it hurts me to admit it, Boogie the Giant Schnauzer is approaching the end of his life. He'll be eleven in November, which is quite old for a 100lb dog, and every month his mobility and strength fades a little more, and it becomes harder for him to manage his daily activities. One of those activities is his monthly grooming appointment. He just can't stand long enough for Jaye (his fabulously patient groomer) to cut his hair the way she used to, even when I give him painkillers. So she recommended something called a "retirement cut," where they basically let him lay down and then he gets shaved the same length all over. He doesn't have to get his leg hair brushed out, he doesn't have to stand except at the very end, and Jaye said he did much better. But we're so used to seeing him with his fuzzy legs that he looks strange to my eye, with his chicken legs and velocirapter claws. Next week he'll be going to see his Vet to see if we can find a daily arthritis medication that will make him more comfortable. We've hesitated to do this up until now because his kidney function is less than optimal, but we think the time has come to balance that with his daily comfort and quality of life. Because taking daily walkies is still the highlight of his day. Just think of it as a puppy cut! My bosses old Greyhound is having problems, the daily Rimadyl and accupuncture sems to be helping. Hope the vet has some good ideas. Hugs to you, Janiece, and skitches to Boogie. This part of pet owning is tough, but I hope meds will help him as much as they've helped Edison. Have you tried Dasuquin? I started it on my ancient cat, and she's doing a lot better. Can run after the food nuggets again when we play "throw food". Laura, we did try that, and he also eats "mobility" Science Diet with the same active ingredient. Poor dude - he's just old. For the last couple years, we gave Grendel Trixsyn and Dasuquin, and Deramaxx with regular kidney and liver checks.